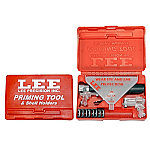 Fastest, most convenient hand held priming tools made. Includes 1 folding primer tray sized to fit today's larger primer boxes, 1 small primer adapter and 1 large primer adapter. Trays built in flipping surface quickly rights and orients primers. Both priming tools use special, but inexpensive hand priming tool shell holders so there is no need to endlessly swap your press shell holders to prime.